If you’re leaving behind a beautifully crafted apartment and heading for a luxury hotel room abroad, you probably find the whole flying ordeal an entirely uncomfortable inconvenience. 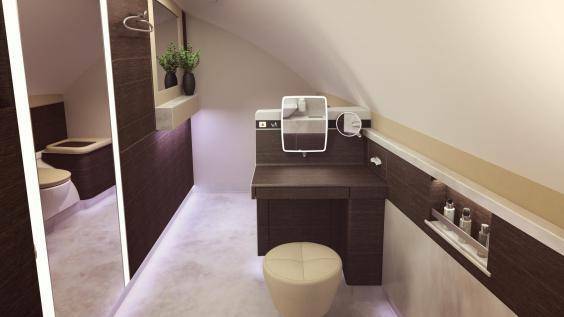 Well, you don't have to lower your standards any longer because Singapore Airlines have launched what are essentially apartment suites in the sky that you rent for the duration of the flight. Fasten your seatbelt and prepare to be blown away. 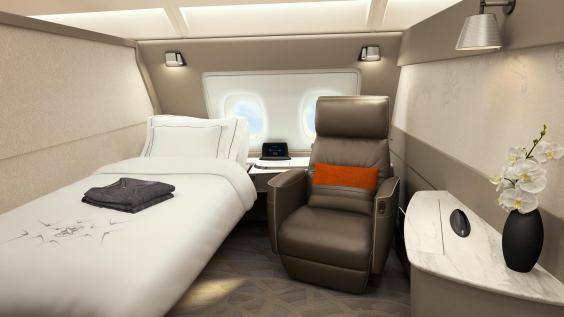 The new Singapore Airlines A380 fleet has undergone an $850 million upgrade, now featuring four classes. Of the 471 seats aboard, just six will be Suites – the highest class available. Each Suite is more than just a seat. It’s a private area, complete with a personal wardrobe, 32-inch screen, leather seats, and two bathrooms (because one is never enough when you’re up in the air). Talk about the height of luxury. “The significant investment that we are making with the introduction of new cabin products demonstrates our commitment to continued investment in products and services, and our confidence in the future of premium full-service air travel,” said Singapore Airlines CEO Mr Goh Choon Phong. The Suite also comes with a bed, and if you’re travelling in pairs, double beds can be requested. Couple that with the mood lighting and Singapore Airlines have really set you up for an enjoyable ride. And to make sure everything’s in order upon landing, there’s a sit-down vanity counter in the room. Of course, the elevated flying experience comes at a price. A return flight from London to Sydney via Singapore will set you back at least $12,500. If you’re a regular commuter, opting for a flying apartment each time you travel could fast equate to a deposit for an off the plan apartment down here on earth. We love indulging in a bit of luxury so we’re all on board for replacing uncomfortable aeroplane seats with exclusive private suites to pass the time – it really flies when you’re having fun, you know. Read more of our lifestyle articles about apartments living here.